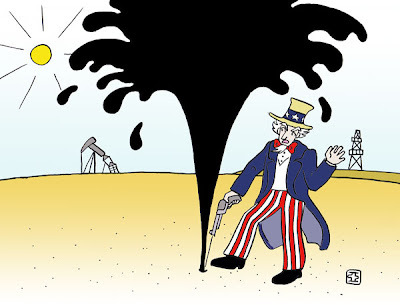 When RebelEconomist began writing this blog a year ago, he planned to write a series of three posts criticising obsolete US economic policies that by needlessly sticking to, the US economic authorities "shoot themselves in the foot". The problem with the third of this series, however, has been that the policy concerned has proved (inadvertently) richly financially rewarding during the last year. Nevertheless, RebelEconomist still considers the policy to be questionable, especially looking forward, and wishes to fulfil his promise to write three shot-in-the-foot posts anyway, so here is the third. The subject of this post is America's massive holding of gold bullion, which dominates its foreign exchange reserves. The post concludes that the main reason why the USA holds so much gold seems to be policy inertia, and argues that for investment and presentational motives, a substantial fraction of the gold should be sold with the proceeds reinvested in reserve currency government debt. As of December 12, the market value of the US foreign exchange reserves including gold amounted to $281bn, with gold valued at the 12/12/2008 LBMA pm fixing of $826.50 per fine troy ounce (instead of the historic value of $42.2222 used in the US Treasury and IMF reports) and reverse repo investments valued according to the cash invested (rather than the value of the collateral assets held). Of this, gold accounts for 77%, compared with the all-country average gold share of reserves of 8.5%. Gold's share of the non-SDR reserves (which is arguably more relevant because the amount of SDRs held presumably reflects US international economic policy rather than a portfolio management decision) is 82%. While the proportion of the dollar market value of the US reserves accounted for by gold has changed with market prices, the US has held much the same physical quantity of gold – just over eight thousand metric tonnes, presently 8133.5 metric tonnes or 261.499 million troy ounces – since the early 1970s. This was the amount of gold that the USA had left when the dollar peg to gold (at a rate of $35 per troy ounce) that provided the anchor of the Bretton Woods fixed exchange rate system finally collapsed in 1973 (a process beginning in 1971 with the suspension of dollar convertibility by President Nixon) under the strain of persistent US fiscal and current account deficits. As far as RebelEconomist knows, unlike other countries which have sold gold, such as the UK, the US government has never reviewed the purpose of its gold reserve, and it seems unlikely that any rigorous secret review would have concluded that the existing holding just happened to be about the appropriate size. Perhaps the US authorities considered that raising the possibility of selling the country's gold would be too controversial, especially given the strength of the US tin foil hat brigade. The obvious problem with holding gold is that it pays practically no interest. It is possible to lend gold, but not normally to sovereign borrowers, and even the unsecured gold loan ("lease") interest rate is relatively low. Naturally, a real asset like gold can be expected to hold its real value over the long run, but in most convertible currencies, real debt interest rates tend to be positive. As a result, conventional asset allocation techniques tend to give gold a low portfolio weight. 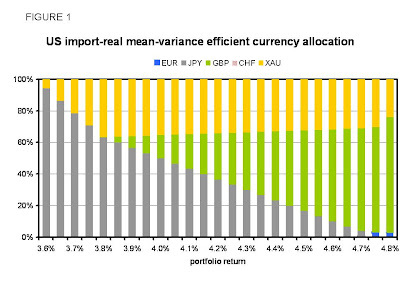 Figure 1 shows the mean-variance efficient portfolio weights optimised for various design portfolio returns for the four non-dollar reserve currencies separately identified in the IMF currency composition of official foreign exchange reserves (COFER) reports, plus gold. At present, the USA holds just euro and yen debt instruments in its currency reserves, plus effectively some sterling via its SDR accounts at the IMF (the present sterling weight in the SDR is 11%). On the assumption that the US authorities would not short-sell other countries' currencies, the portfolio weights are constrained to be non-negative. The analysis is based on quarterly real returns for the period 1990 to 2008 inclusive, with deutschmark returns being used for the nine years before the introduction of the euro. For each currency, each quarterly dollar return comprises the interest return on that currency plus the capital gain into dollars. Three month LIBOR rates were used to calculate interest returns, as these are readily available for the whole of the period; in practice, central banks tend to hold mostly medium term government securities with less credit risk premium and more term premium, so three month LIBOR is not unrepresentative of the return on reserves investments. For gold, a LIBOR-equivalent unsecured bank lease rate is derived from dollar LIBOR minus the gold swap (Gold Forward Offered or GOFO) rate. 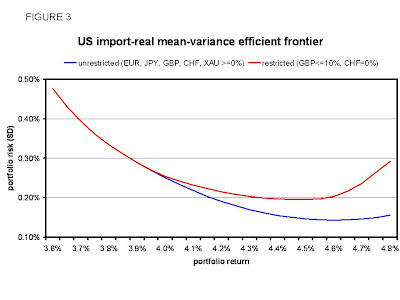 To obtain real returns, the dollar returns are deflated by the US import price index on the grounds that the real value of the US foreign exchange reserves in terms of their foreign purchasing power is most relevant (using real returns rather than dollar returns slightly favours gold, but the results are not greatly different). Despite the more than doubling of the dollar gold price over the 1990-2008 period, gold is given at most a weight of 36% in mean-variance efficient portfolios for low design portfolio returns. This is mainly because gold has the second lowest real return (an annualised rate of 4.2%) of the currencies (ranging from 3.6% in yen to 5.0% in sterling), without its returns being outstandingly stable or uncorrelated with the other currencies (which would give gold a diversification advantage). However, because the optimal portfolio at high returns is dominated by sterling, and hardly includes euros at any design returns, it could be argued that the results are unrealistic because it would not be feasible for America to invest such a large proportion of its reserves in sterling. The Swiss franc's low return means that it is not included at all, although no US reserves are presently invested in Swiss francs anyway, and that market would presumably have an even more limited capacity than sterling. The analysis is therefore repeated with the weights being capped at 10% for sterling and fixed at zero for Swiss francs, to see whether such constraints would imply a larger gold holding. 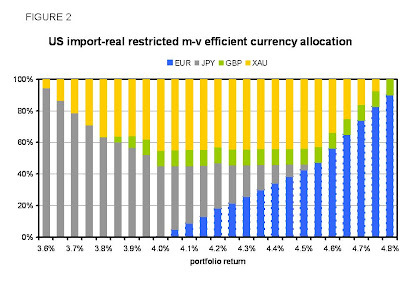 As Figure 2 shows, they do not; while in the restricted analysis more gold is appropriate at medium design returns (up to 45%), at higher returns the euro is now favoured for its real return of 4.8% and most stable real return of the remaining currencies. The analysis strongly suggests that, even given the strong appreciation of gold in recent years, the present proportion of gold in the US foreign exchange reserves is far too high. That conclusion appears to be robust to using different methods and other reasonable assumptions. Optimisation was tried using a mean loss measure of portfolio risk instead of variance, and gave similar results. It could be argued that the sample estimates of return means, variances and covariances are unreliable, but it is unlikely that reasonable alternative estimates would give gold a much greater weighting. In particular, it would be difficult to justify using a similarly high capital gain on gold in the near term without a tinfoil hat scenario for the value of fiat currencies (which, needless to say, the US authorities would not want to use as a working assumption). Critics of mean-variance analysis sometimes argue that an evenly weighted portfolio is just as good, which would imply a non-SDR weight of 33%. It is instructive to examine the efficient frontiers in mean / standard deviation space corresponding to the unrestricted and restricted currency allocations, which are shown in Figure 3. The fact that the portfolio risk is actually minimised towards the highest design returns suggests that, in terms of risk at least, there is little to be lost by choosing a high return portfolio. For a design real return of 4.5%, the restricted reserve portfolio weights are 42% euros, 4% yen, 10% sterling and 44% gold. This compares with the present non-SDR allocation of approximately 9% euros, 9% yen (it is impossible to identify the precise currency allocation in the US reserves because investments in reverse repo are not broken down by currency, but the remaining currency reserves are roughly evenly split) and 82% gold. Comparing the optimal and actual portfolios, the cumulative opportunity loss over the 1990-2008 period has been $26bn in interest income foregone, reduced to $5bn by offsetting capital gains of euros, yen and gold against the dollar (of the currencies considered, only sterling depreciated against the dollar). The gap between the unrestricted and restricted efficient frontiers gives some idea of the cost in return foregone or risk taken of the limited range of currencies in which the US invests its foreign exchange reserves. While sterling and Swiss franc debt markets would not have the capacity to absorb a large fraction of the US reserves, the allocation could be broadened to include other convertible currencies like Canadian and Australian dollars and Swedish krona. There is of course more to the case for holding some gold than just standard portfolio optimisation. History suggests that gold can provide a reliable store of value in times of extreme financial stress, such as during wartime; actually, this property of gold could be allowed for in quantitative asset allocation by using a more sophisticated description of the gold return distribution than just its central tendency (eg mean) and spread (eg variance) - in particular, with more information on the tails of the distribution. Unlike currency, gold is no country's liability and so is not subject to credit risk as long as it is physically under the control of its owner. Indeed, one reason why the USA held the majority of the world's gold bullion at the beginning of the Bretton Woods era was that the UK had been forced to pay in gold for the armaments it purchased from America in the early years of World War Two, as sterling would have presumably been rendered worthless if Britain had been defeated and occupied by the Nazis. As gold has been prized since prehistoric times, gold would probably still be valuable even if civilisation collapsed. Being of high value for a given quantity, valuable quantities of gold are easily and discreetly transported and stored. Of all countries, however, the USA has perhaps the least need for such robust security. The USA is militarily strong, has no land borders with hostile neighbours, and is a stable democracy without violent social conflict. Moreover, as one of the world's largest gold producers, America has a replacement supply and a large holding of unmined gold anyway. There does not seem to be enough justification for America to hold four fifths of its foreign exchange reserves in gold. Another issue is that by holding so much gold, America is sending some perverse signals. When the US Treasury advises emerging market countries to minimise their holding of foreign exchange reserves on the grounds that the typically low interest rates paid by reserve assets makes them expensive to keep, holding so much gold itself makes the USA look hypocritical. In fact, given that, other than a small exposure via SDRs, none of the US reserves are held in higher yielding currencies like sterling, the USA may well have earned less interest income on its reserves than any other country in recent years. And now, at a time when the US authorities are endeavouring to revitalise the market for "troubled" risky assets by effectively exchanging them for safe assets such as treasuries, it looks incongruous to be retaining a massive holding of the most conservative investment of all; even more so when the US Treasury's share of America's foreign currency reserves have been pledged as the backing for a money market fund guarantee scheme. Worst of all, as the Federal Reserve's ongoing aggressive easing has expanded the US monetary base and raised fears of inflationary repudiation of America's massive dollar-denominated foreign debt, holding real assets like gold undermines the Fed's inflation credibility. The tinfoil hat brigade can do without more grist for their mill! In conclusion, there is a strong case on investment and policy credibility grounds for the USA to substantially reduce its holding of gold. Even on the most conservative analysis, America should sell about half of its holding, or about four thousand tonnes of gold, and reinvest the proceeds in its normal euro and yen debt instruments, or even better, in government bonds denominated in an expanded set of currencies. Selling gold would be a spectacularly bad decision by the United States government. Pretty much all the major currencies were diluting at a rate of about 8-10% year for the past decade. Gold dilutes at about 2% a year. Thus the natural return on gold in terms of euro or dollars or yuan or any other diluting currency will be about 6%. That's a better return than pretty much any other investment. Also note that the U.S. has come dangerously close to destroying its currency twice in the past thirty years ( 1979 and early 2008). If someday the government goes to far, and there is a run on a dollar, the only suitable replacement is gold. By holding on to its reserves, USG can at least assure that the flight to gold won't be a complete catastrophe. Of course this whole discussion is silly. If the USG was out to make money, it could just set a 0% dilution policy for the dollar. Doing that would drive a huge flight from euros, yuan, etc, into dollars, generating a huge windfall for everyone holding dollars currently. Without doubt, selling gold would have been a spectacularly bad decision, as it has proved to be for the UK - it may well have cost us more than defending sterling's ERM band. But whether it would turn out to be a bad decision looking forward is a different question. By dilution, I assume you mean the rate of growth of the stock of currency in circulation (if so, your figure looks a little high to me). Here, the point is not just what has happened, and what will happen (and on that, I regret to say that I suspect that you will be right and that inflation will be accepted as a way of relieving the US debt burden), but what is consistent with other economic policy. To argue that the return on gold will not be expensively low requires a forecast of currency growth that suggests that the Fed will breach its price stability mandate. I do not think that government should make policy on the basis that it might "destroy its currency" and prompt "a run on the dollar"! The purpose of foreign exchange reserves is not to make money, but whatever that purpose is (let's assume that the US reserves are held for contingency purposes, although a clear statement of what their purpose actually is would be welcome), it is surely prudent management to serve that purpose at a low cost and low risk. I find it hard to believe that eight thousand tonnes of gold just happens to have been the best solution for the last thirty-odd years. If a key objective is to preserve real value, then it would seem sensible to diversify into other real assets, especially ones with high contingency value such as rare industrial metals, oil, grains etc. I do not think that government should make policy on the basis that it might "destroy its currency" and prompt "a run on the dollar"! One does not want to run a ship into an iceberg, but that does not mean you sell off the lifeboats. Even if the current leadership is confident in its ability to keep the dollar stable, given the propensity of the American public to elect incompetent stewards, a current steward should prepare for future mismanagement by holding on to the gold stocks. A fiat currency requires a very strong government, both internally and externally. Internally, the government must be politically strong enough to resist the temptation to dilute away debt or recessions. Externally, the government must be strong enough to convince other countries to accept its fiat currency as a medium of exchange. The US government is growing weaker on both accounts. A prudent Fed should realize this and keep the lifeboats ready. If China grows tired of holding diluting dollars as foreign reserves, the only practicable alternative is gold (or perhaps silver). China or the Gulf Countries switching to gold would be enough to cause gold to replace dollars as the world's reserve currency. Given that the American people and government depends on the dollars' reserve status for an unhealthy portion of its economic consumption, this would be trouble. If the government had for reason dumped its gold reserves years before, a new gold standard would go from being trouble to outright catastrophe. To argue that the return on gold will not be expensively low requires a forecast of currency growth that suggests that the Fed will breach its price stability mandate. This sentence, particularly the word "price stability" is the crux of the problem. The Fed does attempt to achieve price stability as defined by the CPI. The trouble is that the CPI has little to do with monetary stability and it's monetary stability that is so important. For instance, imagine due to a technological breakthrough, productivity was growing at 10% a year. The Fed could then dilute (grow the money supply) at 10% a year and achieve perfect price stability. But from a monetary perspective this would be disaster. Everyone would trade their dollars for gold, and get an 8% year real return. The dollar would be toast. From 1998 to the 2008 the CPI increased by 2.7% a year. During this same time period, the MZM measure of money supply was growing by an astounding 8.8% a year. The CPI was in its target range. But the money supply was in the danger zone. The result was multiple asset bubbles, and a near currency crisis in the first half of 2008. Changes to the CPI ( hedonics, removing real estate prices, etc ) have rendered it useless as a measure of monetary stability. As long as the Fed clings to the CPI number, the dollar will be in mortal danger. You make a reasonable point about preparing for future mismanagement. Essentially, you are saying that large tail risk justifies holding lots of gold. But this should be explained so that the US authorities (ie the government; the US gold does not belong to the Fed) are accountable for that decision. Even then, I would argue that it would be wise to diversify into other real assets. Holding mainly gold leaves the US highly exposed to idiosyncratic risk affecting gold, such as a technological shock that allows a large increase in gold supply. I thought your idea of the dollar dilution rate looked a little high. The appropriate comparison with the dilution rate of gold is the dilution rate of base money (ie dollars in circulation), not MZM. If MZM can grow faster than the stock of base money (as it has), then it could be expected that, under a gold standard, the growth of gold deposits could exceed the growth of the stock of monetary gold. In a world with a "Money Market Investor Funding Facility", there is no difference between M1 and MZM. There is no imaginable circumstance in which helicopter Ben allows the money markets to implode ( and without the Fed's backing, they would indeed implode, 1930's style). A promise by the Fed to print a dollar is as good as a dollar itself. ...under a gold standard, the growth of gold deposits could exceed the growth of the stock of monetary gold. A competent central bank under a gold standard should not allow growth of deposit receipts to exceed the growth of the gold stock. A competent central bank under fiat money should not allow the growth of zero maturity money to exceed the growth of M0. In either circumstance, excess growth of broad money will eventually trigger a bank run when people realize there is not enough base money to back the deposits in the bank. Now we are getting into wider, albeit interesting, issues Devin, which I have not yet investigated enough to have much of an opinion on. I am sceptical of the idea that fractional reserve banking necessarily leads to bank runs - it seems to me that, even system-wide, it must be possible to devise some braking mechanism - but I am not sure that fractional reserve banking adds to economic efficiency either. Another issue that I am aware of but open-minded about is whether deposit money growth in excess of base money growth is inflationary, because for every unit of deposits that might exert an effect on prices there is a unit of debt that might exert the opposite effect.